(Nanowerk News) In an advance with overtones of Star Trek phasers and other sci-fi ray guns, scientists in Canada are reporting development of an internal on-off "switch" that paralyzes animals when exposed to a beam of ultraviolet light. The animals stay paralyzed even when the light is turned off. When exposed to ordinary light, the animals become unparalyzed and wake up. Their study appears in the Journal of the American Chemical Society (JACS). It reports the first demonstration of such a light-activated switch in animals. Neil Branda and colleagues point out that such "photoswitches" — light-sensitive materials that undergo photoreactions — have been available for years. Scientists use them in research. Doctors use light-sensitive materials and photoreactions in medicine in photodynamic therapy to treat certain forms of cancer. Those light-sensitive materials, however, do not have the reversibility that exists in photoswitching. The JACS report describes development and successful testing of a photoswitch composed of the light-sensitive material, dithienylethene. 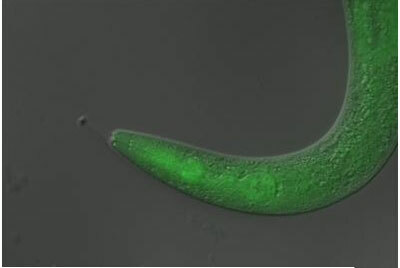 The scientists grew transparent, pinhead-sized worms (C. elegans) and fed them a dithienylethene. When exposed to ultraviolet light, the worms turned blue and became paralyzed. When exposed to visible light, the dithienylethene became colorless again and the worms' paralysis ended. Many of the worms lived through the paralyze-unparalyze cycle. Scientists were not sure how the switch causes paralysis. The study demonstrates that photoswitches may have great potential in turning photodynamic therapy on and off, and for other applications in medicine and research, they indicate.